One of the things I love most about holidays and the changing of the seasons are the opportunities they grant me to slow down and savor. At Thanksgiving I savor the sounds of a house filled with people sharing stories, laughing and watching football. I delight in the smells of turkey and potatoes and pies baking, all the scents mixing together. At Christmas I sit and enjoy the scent of a freshly cut pine tree, the fragrance of gingerbread baking and my eyes linger on the ornaments on the tree as I remember the memories connected with each one. In May I’ll often be found taking a few minutes to wander around my front yard looking for the first blooms on the clematis and my roses. Then I’ll head to the backyard to see how the newly planted tomatoes are doing and try to decide if the lettuce is big enough to pick yet. I delight in days, or even small moments, when I can slow down and savor the beauty and meaning around me. As it is with certain holidays or seasons, so it is with certain books. Some books I devour, picking them back up with every spare moment so I can find out what happens next. Other books I read steadily, working through them in a short number of days. Some books I drag through, simply determined to finish what I have started. But some books I savor. 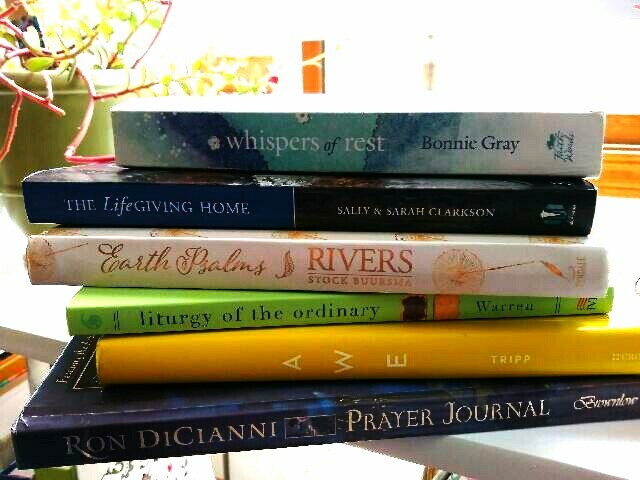 These are the books I read in the quiet morning hours before anyone else is awake. They are the books I know will stir my soul. Sometimes I choose them for the topic – something I need to grow in, or be encouraged in or challenged by. Sometimes I choose them because of the author – someone who has become a trusted friend because of the words they share, or who someone else I trust has recommended to me. Sometimes I choose them because I pulled them off a bookshelf and the cover or the pictures drew me in or the way a paragraph was worded spoke to my heart. And then I place them on the bookshelf beside my chair and anticipate reading them in the months ahead. I work them into my morning rotation, reading each one day a week. It often takes me six months to work my way through these books. But there is beauty for me in that, reading slowly, journaling, letting God speak to me through the words of others and knowing I will return for more next week. These are the books that sink deep into my soul, imparting truth in a way I cannot find when I read cover to cover in a matter of a few days. My Monday book is Whispers of Rest by Bonnie Gray. This is one I plucked off a bookshelf at Barnes & Noble and fell in love with because of the beautiful cover, whispered words of rest, and simple life-giving activities included. I love starting my week off with this book, being refreshed in God’s heart for me. Because I value being in the Word on a regular basis, Tuesdays and Thursdays are my days to read and study in the book of John. In the beginning was the Word… John is one of my favorite Biblical authors because of his beautiful word pictures. I am the Vine and you are the branches…Abide in me. My Wednesday book came recommended by Literature Threads creator, Stephanie, who understands my heart for books that encourage me to live deeply in the everyday: Liturgy of the Ordinary by Tish Warren. I’m drawn to the idea of liturgy, of marking our lives by the celebration and lament of the liturgical calendar. This books moves liturgy from the calendar into the everyday events of a day from making the bed to drinking tea to going to bed. It’s changed some small but important practices in my day, bringing renewed meaning into my day. I have two Friday books. On Fridays my kids are Earth Psalms by Francine Rivers, a book I love equally for its simple words of truth and its gorgeous pictures. I’m reminded that we can see God in all of His creation and that some truths are truly simple, I just need to choose to live them out. The second book is a For This Child I Pray: A Mother’s Prayer Journal with artwork by Ron DiCianni. I struggle with prayer and this guides me in writing out specific prayers for myself in my mothering and for my children. I take a reading break on Saturdays and savor being able to sleep in for an extra hour. On Sundays I’m spending time in Awe by Paul David Tripp. My husband and I are both reading this and I appreciate reading a bit behind him and seeing what he has underlined. Though the book is written more to those in leadership or ministry roles, I am challenged to apply it in the realm of my simple, everyday life. Last, there is the book I pull out at the end of the month, to tune my heart to the feel and events of the month ahead. I read Sally and Sarah Clarkson’s The Life Giving Home from cover to cover over a week of vacation a few years ago. But now I pull it out to prepare my heart for a new month, to think through practices for my family, activities to pursue, decorations to put out. The American Heritage Dictionary defines savor: To taste or enjoy with zest; relish. For those of you who are looking for books to savor, to read slowly and let sink deep, we hope to be back every few months with a list of books to savor. Some may be seasonal, some may be books from certain seasons of our lives, others may be what we’ve savored with our kids. 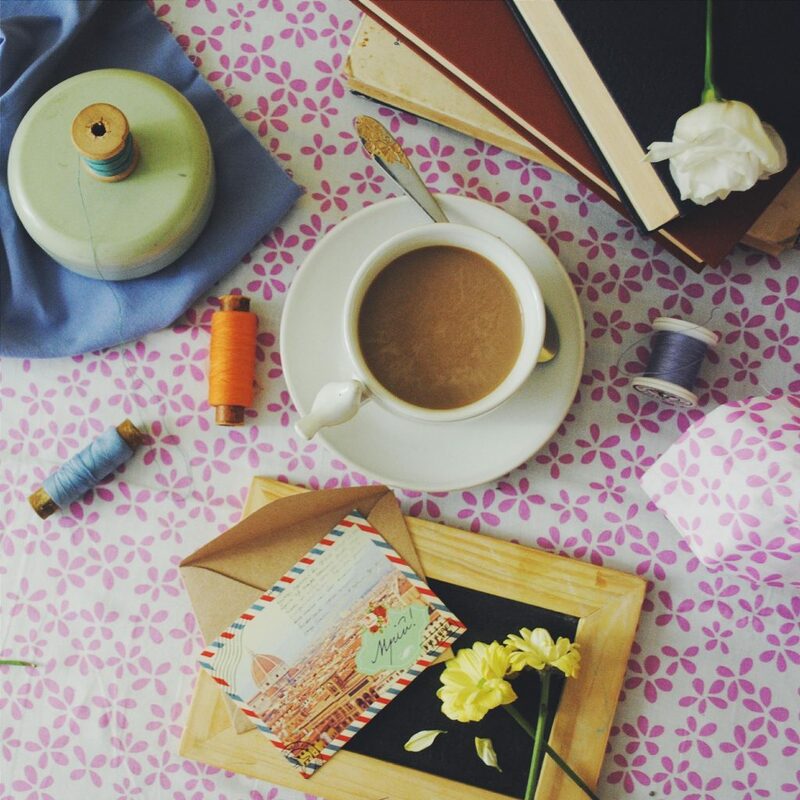 Regardless, we trust that they will whet your appetite for a cozy blanket, a cup of tea and a good read.